The members of First Congregational Church have service to others in their hearts. 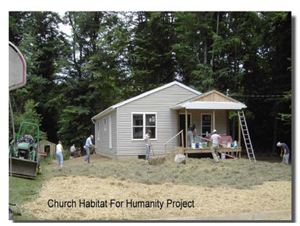 An example is our involvement with organizations like Habitat for Humanity and programs like “Supper on the Square.” We gather food for our local food pantries, provide Thanksgiving dinners to the needy and hold an annual Christmas “Giving Tree” which helps clothe and surprise needy children inside and outside our congregation. Our semi-annual Rummage Sale generates funds for our charitable giving. Individual parishioners also lend their focused skills to the work of the church and the National Association of Congregational Christian Churches (NACCC) of which we are an active member. A member of First Congregational served as the editor of the “Congregationalist” magazine for some fifteen years. Members and staff have served on the Executive Board and other leadership positions within NACCC since its founding. Our service to humanity does not stop at home, but extends worldwide. 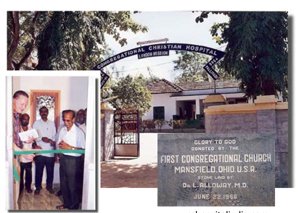 Our Congregation became involved in the needs of the Congregational Christian Hospital in Palliyadi, South India. We supported the building of a Clinic to help address their urgent medical needs. At a time when there was no hospital around the area and people had no easy transportation to other faraway hospitals, this much needed hospital was started with financial support from the First Congregational Church, Mansfield, Ohio and the Missionary Society of the NACCC.